I know most Americans and a lot of “westerners”, particularly at high levels of governments, are currently thinking Putin got away with murder. 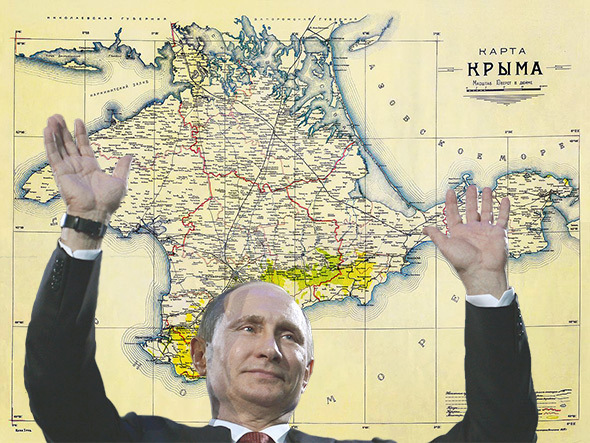 Somehow he “stole” Crimea in the blink of an eye and now there’s nothing we can do about it. He outfoxed us and now we’re flaring our nostrils and trying to drown our sorrows. But in reality that’s not how our grandchildren are going to view this. The way Russia will go down in the hypergalactic Wikipedia of the cloud future will be as the last country to expand its borders in history. The signs are everywhere. Here in Romania the Szeklers are on the march once again for autonomy. Barcelona is pushing to break away from Madrid. Half of Scotland is ready to secede from the other half of Scotland. Everyone wants autonomy and it won’t be long before autonomy becomes independence. (Hopefully) peacefully or not, one way or another, the countries of the world are going to get smaller from here on out. And Russia will be remembered as the last dying breath of a fossilized form of governance. Why should the people of Transylvania have to be ruled over by people in Bucharest? How does that benefit us in any way, shape or form? And what does Bucharest get out of the deal? In Catalonia they speak a different language than the central government. What’s in it for them to stay connected to one another? Venice is already separated by water and yet they want to get even further away from the rest of Italy. And why not? If it’s done peacefully and by referendum, what’s it hurting anyone? We’ve forgotten how the world has changed. And we’ve forgotten what the internet allows us to do. We’re already separated. We no longer watch the same shows on television, nor at the same time, as everyone else. We record them or download them or stream them and we watch them when we want to. We no longer listen to a common radio but have our own playlists and “tunes” for our own enjoyment, on demand, at our private beck and call. If you’re not from around here, what’s the difference between Ukraine and Crimea? None. We see it on our youtubes, on our livestreams, on our iPhone apps and they’re all real people that we have no urge to see suffer or get blown to bits. Why must there only be one Ukraine? Why not 50 different Ukraines, each free to associate with one another as much or as little as they like? Autonomy hurts no one except those who misunderstand the future. We have thrown a blanket of interwoven non-stop connection between almost all the peoples of the world and are no longer reliant on those in physical proximity to us. It used to take a week on horseback to travel between Philadelphia and New York and now we can Skype and Hangout across the planet in an instant. That trend is only going to continue and as it does, the countries of the world are going to fragment as people move towards more autonomous styles of administering their societies. It used to be that pronouncements would come down on high from the capital and have to be accepted as the iron law. But now we see the follies of our leaders live, 24 hours a day, in minute detail. Why we do still need that? They always say “for security”, but one of the biggest breeders of insecurity is precisely the lack of autonomy. Populations are restless when they’re jammed together with differing values and cultures. If the Szeklers could be Szeklers and not have to live in some bizarre conformity with a government half a league away, why wouldn’t they prefer that? And what’s Bucharest benefiting from them? Government is business and more and more business is being conducted over the internet, as it should be. Commerce, money, tourism (sometimes) and communication passes over borders nearly effortlessly as it is. The more that increases, the less we’ll need bulky and awkward coordination from a faraway capital. Half the people who work in offices today could be working from home and the other half will be able to when high-definition 3D video interchanges become a commonplace feature of the internet. One day our avatars are going to be debating and voting on real laws in a virtual reality setting. Poor old Putin. He’s probably riding high on a surge of adrenaline right now, thinking that he just made a great leap forward for Russia and the Russian people. But the history BookCube apps will show instead that he just made a quaint and archaic move to increase the size of a sovereign entity instead of letting it fragment organically. PSST – that’s the biggest secret of them all. Putin swore up and down that the takeover of Crimea was done by spontaneously forming self-defense groups of local people and nobody believed him. But the American government has already admitted that it intercepted no military traffic to coordinate and direct these “soldiers”. Believe it or not, it really was (almost entirely) the local people. That’s because they were riding the tide of history towards local autonomy and fragmented from the rest of Ukraine naturally. Due to technical reasons, for a brief moment Crimea was an independent nation before it was formally adopted into the Russian Federation and, just like in Texas, people aren’t going to soon forget that fact. The only problem with fragmenting countries is that it takes us 2000 years back to the time when each city was a state. Unfortunately, in modern times we have a lot of formalities to do if we want to travel or work in other countries so bureaucracy is only going to increase when the number of countries increases. Also, fragmentation means people who want to separate themselves from slightly different people (two eyes, one mouth, two arms, two legs, but different dialect or different language), as in contrast to people who tolerate or like diversity. Being an “independent” little country is fine and dandy until a nut-case named Adolf (many other names can be given) decides to conquer you for one reason or another and all of a sudden you lose everything! Well, somebody has to build roads and railways and hospitals. I don’t think you could do that from the couch unless you believe you live in some fantasy SciFi movie. How does this negate Sam’s point? Local governments cannot do this?